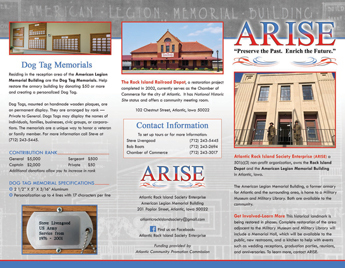 Atlantic Rock Island Society Enterprise (ARISE) a 501(c)(3) non-profit organization, owns the Rock Island Depot and the American Legion Memorial Building in Atlantic, Iowa. The Rock Island Railroad Depot, a restoration project completed in 2002, currently serves as the Chamber of Commerce for the city of Atlantic. It has National Historic Site status and offers the Rowe Conference Center for public rental. The American Legion Memorial Building, a former armory for Atlantic and the surrounding area, is home to a Memorial Hall, Military Museum, Military Library, Atlantic History Center, and Flag Room. All are available to the community. The Memorial Hall may be rented for events.